Being first into northwestern Cambodia to have a look at the gold, ruby and sapphire deposits! We were really in Cambodia for another purpose. Our earlier gold prospecting efforts in north-eastern Cambodia warranted a follow-up expedition with an 8-inch production dredge. While we were waiting in Phnom Penh (Cambodia’s capital) for the dredge to clear Customs, there was a big shake-up in the Khmer Rouge rebel regime. Pol Pot, the Khmer Rouge leader, was captured and placed under arrest by his own generals. The 30-year civil war was finally over! Several of the key Cambodian players involved with our dredging operation were originally from the Pailin area of northwestern Cambodia. 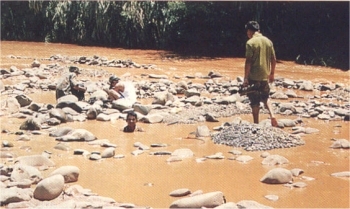 Pailin is well known as one of the richest gem areas in Asia. It has also been the stronghold of the Khmer Rouge regime since the early 1970’s, protected and defended by six million land mines. While we were waiting for customs to clear our equipment, old acquaintances from Pailin reestablished friendly relations with the Cambodian officials associated with our program. 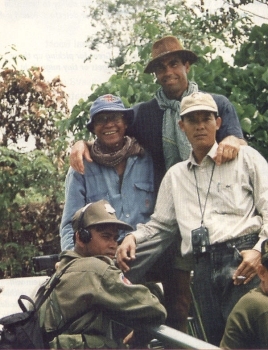 Pretty soon, we were involved in serious negotiations, and we were being encouraged to make an expedition up into northwestern Cambodia to take a firsthand look at the gold, ruby and sapphire deposits. Our invitation was extended from the top officials controlling the area. We were provided with substantial security and invited to stay in the home of one of the area’s leaders. Vehicles were provided to us, along with guides. It was clear from the beginning that our expedition was well organized and planned. 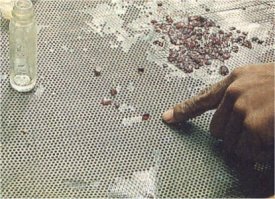 to excavate gravels onto a classification screen for gem recovery. The first thing I noticed while traveling into the area was that they love Americans. During our entire stay, I did not see anyone who did not greet me with a heartwarming smile. Many people cheered when they saw us, as we were the first Americans into this region of Cambodia in about the last 30 years. Several generations of people there have never even seen an American before. We were stopped at the final security stop for a passport check. I gather that is something they seldom do when you are being escorted by colonels and generals who are carrying documents signed and stamped by the highest level of government. I think the guards were so surprised to see us, they wanted to check what planet we were from! After looking at our passports, we were waved through with big smiles and cheers from all the border guards. 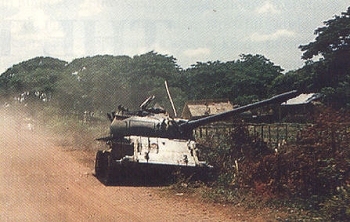 A Vietnamese tank which did not survive the mine fields alongside the road to Pailin. 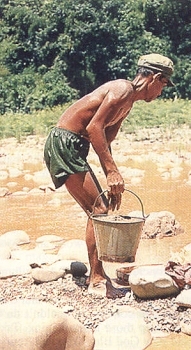 On the road to Pailin, the United Nations was already busy removing land mines. It appeared as though there were hundreds of specialists removing the mines. We were told that because the mines cannot be located with metal detectors (because there is no metal in the mines), the mines were being pinpointed by using some type of sophisticated electronics from airplanes above. Once we arrived at our destination, we were warmly received by the top officials (and their many soldiers and bodyguards) with a celebration that lasted far into the night. During the following days, we were given a substantial tour of the ruby and sapphire fields. 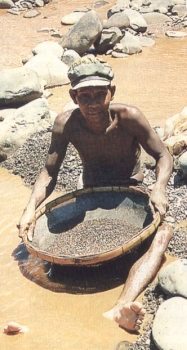 Most active mining was very small-scale and primitive. 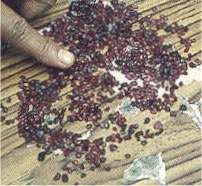 But the product being recovered was clearly rich and abundant. We saw some small hydraulic mining operations in the ruby fields, where the miners were recovering a lot of stones, while processing just a little bit of gravel. We saw simple panning and screening hand operations, where the excavation was being done underwater with buckets. 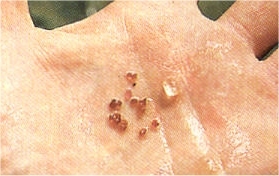 They were recovering handfuls of rubies. As gemstones have a much lower specific gravity than gold, we were mindful that suction dredging for them was going to require a special recovery system. In one area, local officials were demonstrating for us how rich the area was using a gold pan. 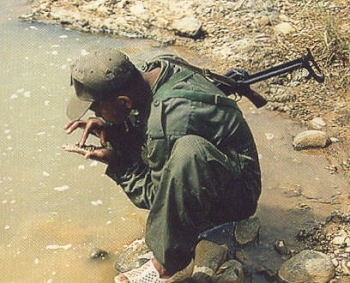 Then, one of the soldiers reached down and grabbed a single handful of gravel off the surface of the river-bottom. He came up with three rubies. 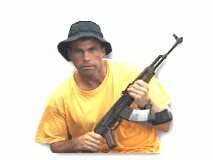 Pretty soon, all of the soldiers were doing it. They gave the rubies to me. It didn’t take long to fill up a whole bag. It was pretty convincing to me! The rubies were small. My understanding is the deeper you go into the gravel, the more plentiful they become and the bigger they get. 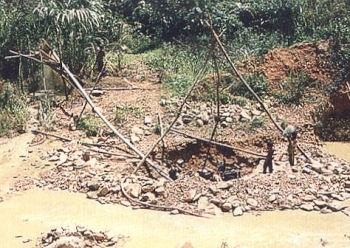 The problem for the local miners is that they cannot excavate more than about a meter deep, because they are using buckets in moving water. We were told most of the bottom stratum of gravel in the rivers have not yet been mined. 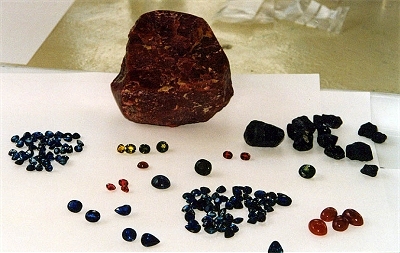 Fine material is screened out and then gems are hand-picked from the screen. All the same, I saw some fantastic gems-one ruby about the size of a baseball! They offered to sell it to me at a wholesale cost of one million dollars. Unfortunately, I was not carrying that kind of cash with me. The annual rains were just beginning as we finished up with our expedition. Besides establishing that valuable deposits do indeed exist there, we were able to make friends with the people who control the area, along with many others. Naturally, we are invited to return with dredging equipment. This preliminary evaluation was very successful, even though it was done with almost no planning in advance. Based upon the information that we gathered, though, we would be able to do good logistical planning in advance of our next project into the area.